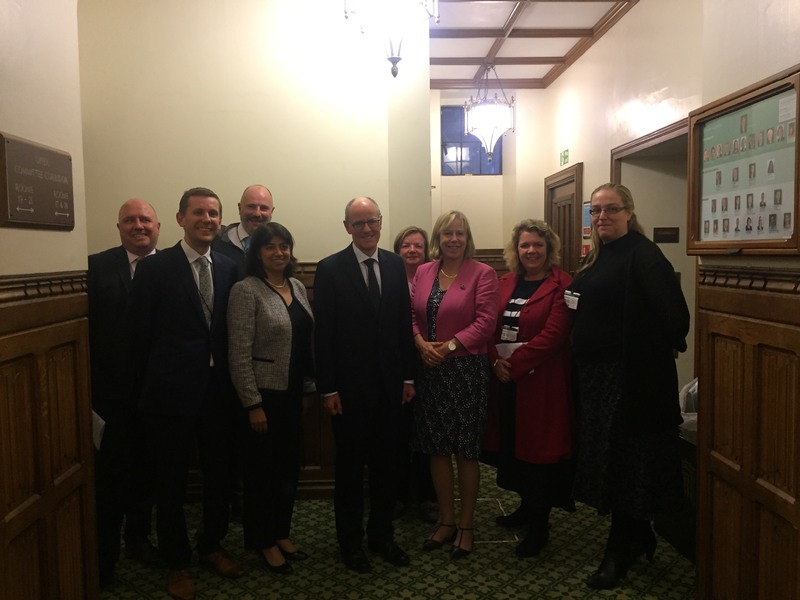 West London MPs Ruth Cadbury and Seema Malhotra put pressure on Education Minister Nick Gibb yesterday in a meeting with local councillors, head teachers and parents over real-terms cuts to school budgets. The group quizzed the minister on shortfalls in funding facing schools in the constituencies of Brentford and Isleworth and Feltham and Heston that include most of Hounslow, with head teachers and parents strongly criticising cuts to their schools services. They also took the opportunity to explain to the Minister how their schools are being impacted and the measures they are being forced to take. Brentford and Isleworth MP Ruth Cadbury, who met with the Minister for Education Nick Gibb with Head teachers, parents and councillors yesterday, said: "These totally unacceptable real-term cuts are clearly damaging schools and harming our children's opportunities. My constituents are reporting increased class sizes, cuts to the curriculum and staff not being replaced. It's unfair to expect our schools and teachers to maintain our very high standards of education with an ever-decreasing budget. The discredited austerity philosophy of this government is failing to provide adequate funding for our children's education." Feltham and Heston MP Seema Malhotra, who also joined the meeting said: "I am proud of our record of education achievement in Hounslow and to have attended Heston Primary and the Green School myself as a child. But with our schools under increasing strain from growing cost pressures and demand for more school places, it is vital that the voices of parents and teachers are heard. We will be working with the Minister to follow up on the vital action needed to prevent further losses of teachers and support staff, to limit class sizes and save other school services. Our children are our future and deserve the best start in life." The lead member for Education at Hounslow, Cllr Tom Bruce, pointed out that schools in Brentford and Isleworth have a successfully high standard of education, the current funding levels however threatened the ability of local schools to maintain this. 1 in 3 local Primary schools are ranked in the top 250 nationally, with nearly all schools ranked either 'good' or 'out-standing'. During the meeting, local head teacher, Farley Marsh, of St.Mary's Catholic Primary School, explained to the Minister that: "Changes to Government funding are forcing the school governors to consult on changes to the school week and are forcing him to narrow the curriculum and drastically cut back our services." Chief executive of the Tudor Park Education Trust, Victoria Eadie, told Gibb: "Enormous cuts over the past four years, have left local schools cut down to the bone. Exacerbating the situation, vulnerable students are left without outside support due to cuts to local support services, putting further pressure on teachers and leaving students not in a state to learn, not able to come to school and with mental health issues." Concerned parent, Stephanie Doherty, shared her and other parents concerns that due to changes to school funding her son's school no longer has any full-time Teaching Assistants resulting in him experiencing less support in the class room and parents being asked regularly to contribute to school funds. * Increase flexibility of the schools funding formula so that school funding accounts for cost-pressures such as inflation, N.I. contributions, pensions and the apprenticeship levy to prevent real-term cuts. * Allow greater flexibility for Local authorities to address budget shortfalls. * More budgetary forewarning for financial planning, especially regarding real term cuts to allow time for adjustment. * Advanced warning of any Teacher pay increases and additionally funding to provide these rises, which London teachers desperately need as most can't afford to live in London and are leaving the constituency. * Greater influence on the creation and location of new free schools locally so that any free schools can collaboratively grow in the area so as to not exacerbate issues with places and funding. The Minister of State for School Standards and Minister for Equalities, defended the plans saying "there are no cuts to funding", but accepted that schools are experiencing a real term loss of services. Gibb ended the meeting by promising to visit St Mary's in Isleworth to see for himself the effect of the cost pressures on local schools.